The nineteen year three month career of D5235/25085 saw allocations to all regions apart from the Southern. Time between last Classified repair and withdrawal: 30 months. 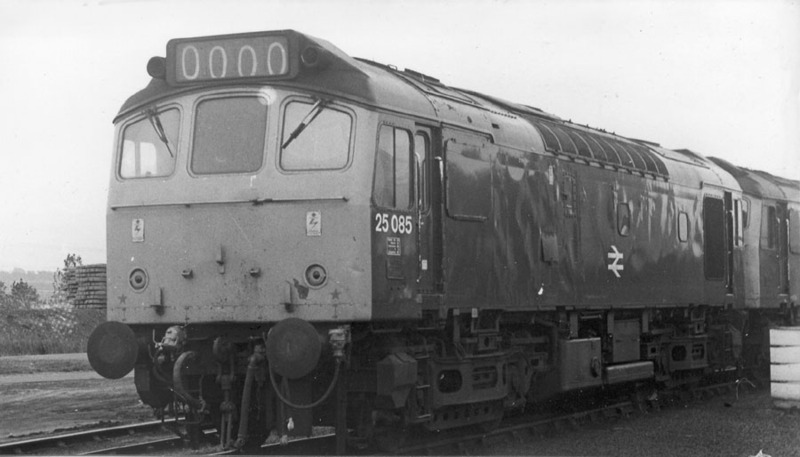 25085 was the 125th Class 25 withdrawn, the only member of the class retired during March 1982. 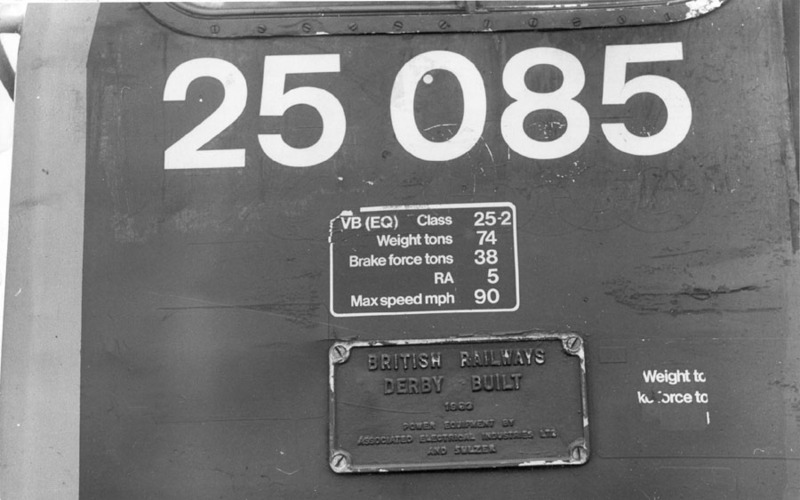 25085 had reached Derby Works during March for engine repairs, these were not approved and the locomotive was withdrawn whilst at the Works. 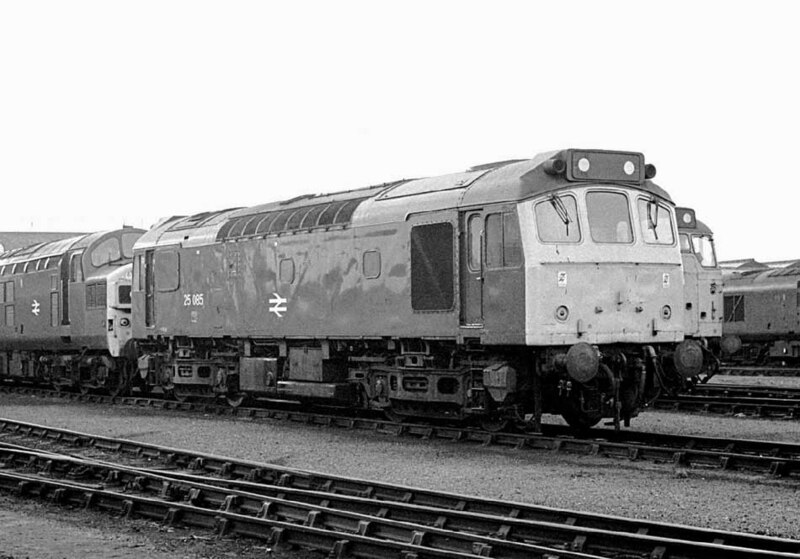 It would be scrapped at Derby by the end of May 1983. Noted Glasgow Works August & September 1979 (Intermediate repair). Noted Derby Works March 1982 (N1 repairs, withdrawn after evaluation). D5234 & D5235 were sent out on their test runs to Corby on December 4th 1963. The 09.03 Leeds - Llandudno featured D5181 on June 19th & D5235 on June 26th. May 25th found a Derby - Blackpool excursion in the hands of 5235 & 7651. 5235 & 5535 were noted on the 08.00 Walsall - Yarmouth (as far as Norwich) on June 2nd. After nine years allocation to depots along the Midland mainline 5235 transferred to Eastfield during August. By October 5235 had moved south to Tinsley. Although the small batch of Type 2's which included 5235 were oddities in terms of their bodystyling & being boiler equipped, this technical difference did not affect the issuing of TOPS numbers for them, they were numbered in order with the remainder of the Class. On November 5th the 06.43 Peterborough – Kings Cross arrived behind 31108 & 25085. After eighteen months at Tinsley 25085 transferred to Cardiff during March. Its stay here would be brief, during August it was transferred to Eastfield. 25084 & 25085 were in Derby Works for repair between April & June. April 5th found 25085 working the 09.10 Edinburgh - Inverness via Ladybank & Hilton Jct. 25238 & 25085 were noted at Oxford on August 5th on the long distance Leith - Yeovil pipe train, presumably the Class 25s came off at Oxford. Two days later 25085 was noted at Leicester. During the middle of September 25085 was noted on local trip work from Willesden, no doubt Haymarket would have preferred to have their boiler fitted locomotive returned north as soon as possible. The 17.20 Edinburgh - Dundee was worked by 25085 on September 12th. On August 10th 25085 was noted at Inverness shed for most of the day. 25085 was noted at Eastfield on the evening of August 14th, the next day (15th) 25085 was noted southbound light engine at Arbroath shortly after midday, and was later noted stabled at Dundee shed the same afternoon. 25085 worked the 14.44 Glasgow Queen Street - Dundee on September 23rd. The 8M36 Tyne Yard - Carlisle freight was hauled by 25085 on October 25th. Photograph courtesy A Forster. 25085 stands at Millerhill on October 14th 1978. 25085 was noted in Glasgow Works on August 19th. 25085 was at Glasgow Works during August & September for an Intermediate repair. 25085 was noted on the 15.57 Dundee - Glasgow Queen Street on September 21st. Photograph courtesy A Forster. A closeup cabside view of 25085 reveals a plethora of numbers, data panels and worksplate, seen at Millerhill January 2nd 1980. 25085 was in charge of the 1A53 17.12 Glasgow - Ayr on April 25th. 25085 was stabled at Inverness on June 9th. On July 10th 25010 & 25085 worked the Perth - Kensington motorail as far as Mossend. The next day 25085 came to the rescue of an ailing 47210 working the 17.40 Edinburgh – Inverness. The Class 25 was sent from Perth to push the failure from Stanley Junction to Murthly, here detaching the failure before heading out alone to Dalwhinnie where 47040 was added to the train for the run to Inverness. After five years on the Scottish Region 25085 transferred to Springs Branch during October. 25085 was transferred to Toton during January. Photograph courtesy Tony Sayer. 25085 rests at Thornaby on February 15th 1981, with all the signs that its last Works visit was handled by Glasgow. Engineering work at the south end of the WCML led to diesel substitutions, on March 1st 25085 covered one brief working between Stonebridge Park and Euston whilst the 20.45 Barrow - Euston was worked forward from Bletchley by 25084 on 3rd and 25085 on 8th. Some lucky 'BedPan' commuters had the delights of 25058 & 25085 on the 07.40 Bedford - St Pancras service on May 5th. 25085 was transferred from Toton to Kingmoor in May. The 16.02 Crewe - Cardiff was worked by 25085 on June 26th, the next day it worked the 17.10 to Crewe. On August 1st 25085 & 25032 worked a ‘Welsh Marches Pullman’ charter between Shrewsbury and Chester, following the failure of Black Five No.5000. On August 10th 25085 worked a Shrewsbury - Bristol empty van train, then ran light to Severn Tunnel Junction. The next day (11th) the 12.10 Penzance – Glasgow went forward from Bristol behind 25085. On August 22nd 25085 was diagrammed for the 10.14 Perth - Motherwell, it only got as far as Gleneagles before requiring the assistance of 20121. A short trip for 25085 was working the 14.05 Blackpool - Crewe as far as Preston on September 5th. An Open Day at Warrington Central on October 11th featured 25085, 40115, 47334, a Class 08 and a number of other vehicles. The failure of 45009 at Derby on October 15th whilst working a Newcastle - Bristol service led to 25085 taking over as far as Birmingham - this may have been 25085's last passenger working. 25085 was retired during March, possibly whilst at Derby Works with an engine defect. Photograph courtesy Paul Bettany. 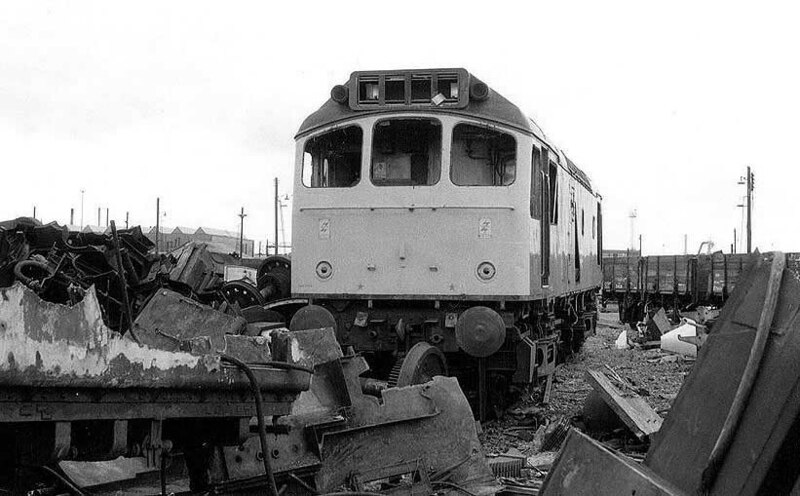 Surrounded by the wreckage of its sisters 25085 stands in the scrapping area at Derby Works on September 4th 1982. The locomotive would linger here until May 1983 and would become the last complete locomotive to be scrapped at Derby by BREL staff. April was the last month for the scrapping of locos at Derby Works by BREL staff, 25085 was the last complete locomotive to be cut, a start was made on 25261 but a dispute halted cutting on this locomotive. Page updated February 25th 2019.